SpillFix International manufactures a full range of spill kits suitable for all applications from containment and clean up of blood and body fluids to containing a mercury, chemical or oil spill. Heavy fines are imposed on companies who do not have adequate means of containing a spill and a suitable means of preventing contaminants form entering storm water systems and water courses. It is preferable to have kits tailored to suit your site's specific requirements. 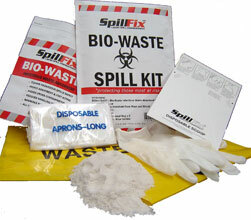 Our industry experts can structure a kit to ensure that you are prepared for all potential spills. Oil and petroleum spill kits can be structured to suit both land and marine applications. HazChem Transport Kit: Use in trucks and vehicles. Kit contents: 1 x bright yellow weatherproof carry bag, 1 x 2.5kg bag Spillzorbe, 2 x HazChem yellow mini booms 75mm x 1.2m, 8 x HazChem Yellow H/W pads, 1 x pair chemical gloves, 1 x disposable bag & cable tie, instruction guide / re-order guide, material safety data sheets. Oil Only Transport kit: Ideal for storing under or behind vehicle seats. Contains approximately 20 litre spill. Kit contents: 1 x bright blue weatherproof carry bag, 1 x 2.5kg bag Spillzorbe floor sweep absorbent, 8 x Oil Only bonded Pads 2 x white poly mini booms 80mm x 1.2m, 1 x pair green nitrate industrial gloves, 1 x disposable bag & cable tie, instruction guide / re-order guide, material safety data sheets. General Purpose Transport kit: Ideal for storing under or behind vehicle seats. Kit contents: 1 x red weatherproof flat carry bag, 1 x 2.5kg bag Spillzorbe premium floor sweep, 8 x General Purpose (Universal) H/W grey pads, 2 x mini booms 80mm x 1.2m, 1 x pair green nitrate industrial gloves, 1 x disposable bag & cable tie, instruction guide / re-order guide, material safety data sheets. HazChem Kit: Standard or configured to your requirements. Kit contents: 1 x 120ltr labelled wheelie bin, 2 x disposal bags & ties, 20 x HazChem pads, 4 x HazChem mini booms, 3 x 10kg bags Spillzorbe floor sweep absorbent, 1 pair chemical resistance goggles, 1 x pairs nitrile chemical resistant gloves, 1 x pair chemical goggles 1 x instruction guide / re-order guide, material safety data sheets. Oil Only Kit: Contains approximately 90 litre spill. Kit contents: 1 x 120ltr labeled wheelie bin, 2 x disposal bags & ties, 20 x Oil Only bonded pads, 4 x Oil Only mini booms, 3 x 10kg bag Spillzorbe floor sweep absorbent, 1 x pairs nitrile gloves, 1 x instruction guide / re-order guide, material safety data sheets. General Purpose Kit: Standard or configured to your requirements. 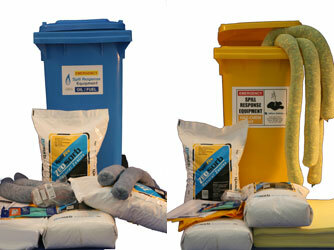 Kit contents: 1 x 120ltr labeled wheelie bin, 2 x yellow disposal bags & ties, 20 x General Purpose pads, 4 x General Purpose mini booms, 3 x 10kg bag Spillzorbe, 1 x chemical goggles, 1 x pairs nitrile gloves, 1 x instruction guide / re-order guide, material safety data sheets. 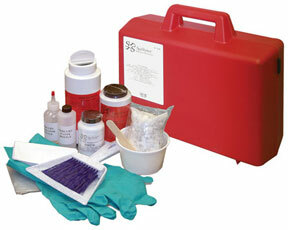 HazChem Kit: Standard or configured to your requirements. Kit contents: 1 x 240 litre wheelie bin, 40 x pads, 5 x 10kg bag Spillzorbe 7 x 80mm x1.2m boom, 1 x goggles, 1 x Nitrile gloves, 2 x disposable bag x cable tie, 1 x sticker, 1 x instruction guide / re-order guide, material safety data sheets. Oil Only Kit:Standard or configured to your requirements.. Kit contents: 1 x 240 litre wheelie bin, 40 x heavy weight oil / fuel only absorbent pads, 5 x 10kg bag Spillzorbe, 7 x 80mmx1.2 Oil Only mini-booms, 1 x Nitrile gloves, 2 x disposable bag & cable tie, 1 x sticker, 1 x instruction guide / re-order guide, material safety data sheets. General Purpose Kit:Standard or configured to your requirements. Kit contents: 1 x 240 litre wheelie bin, 40 x pads, 5 x 10kg bag Spillzorbe floor sweep absorbent, 7 x General purpose mini booms 80mm x 1.2mtre, 1 x goggles, 1 x Nitrile gloves, 2 x disposable bag & cable tie, 1 x sticker, 1 x instruction guide / re-order guide, material safety data sheets. All body fluids should be considered potentially infectious and dangerous. If you encounter a spill, ensure that you are protected and use personal protective equipment (PPE). Never be without the correct equipment required to effectively manage spills in a SAFE, environmentally friendly manner. Suitable for security guards, hotel staff. This hardy kit ensures that you and your staff are never left unprotected. 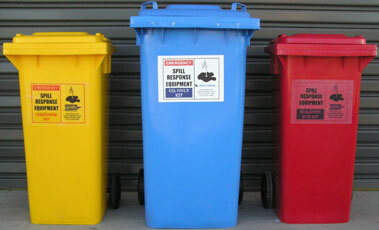 All contents are disposable and provide adequate protection against blood and body fluid spills. Contents: face mask, yellow plastic biohazard bags, ties, gloves, fluid absorbent, sign, scraper, antiseptic hand towel, apron, instructions. Infectious kits / blood & body fluid cleanup. These kits provide sufficient contents to deal with up to 20 blood and body fluid spills. 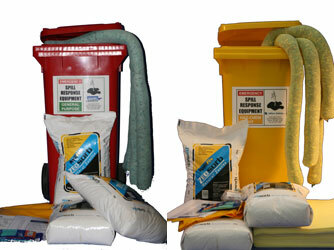 All items are restockable and products are readily available from SpillFix International. Contents: Quantity of 4, 10 or 20 of each: face mask, yellow plastic biohazard bags, ties, gloves, fluid absorbent, sign, scraper, antiseptic hand towel, apron, instructions. Specifically designed kit to suit hazardous environments. Available in 120 or 240 litre, and various colours.